hightouchmegastore: Today in AWP news. I bought a zillion tiny books, both there and at the book fair. which was, frankly, a little bit thrilling. After that, we went to a fantastic farm to table restaurant that was, as is the nature of such enterprises, also hilarious. 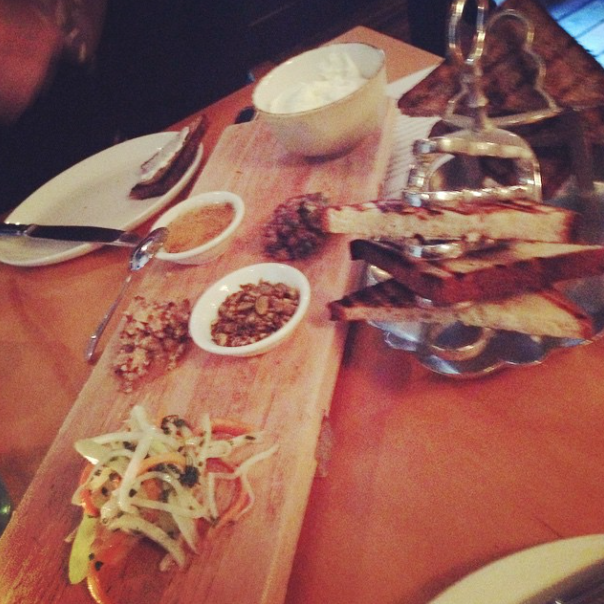 Featuring: an improbably wonderful toast course. As in: toast, the bread. from right to left: toast & toast accoutrements. fresh whole milk farm (of course) cheese. honey. seeds. mushrooms. slaw of carrot and celery root. I also wrote a poem about it.